Our thanks to writer, Jill Whalen, at the Standard-Speaker newspaper for writing an extensive article about the Genetti family of Hazleton, PA. When I sent out press releases a few months back, I had expected just a few paragraphs about our October reunion to be published in the paper. I was completely blown away by the full-page article detailing our family’s history in the area and their involvement in local business. Jill obviously did her research – digging into old family documents, genealogy records and newspaper archives. Since my memories of our family businesses are as a child – my father taking me for a visit to the Tyrolean Room (where he worked) or buying groceries at our local Genetti market, I was surprised by many of the details Jill included in her article. Some of which I wasn’t aware of! What a great piece to include in our growing family archive! The complete article can be found as a link on our Family News page. Or just click here and go directly to the article page on our website. Want to read the article online at the Standard-Speaker? Click here for the original story. I’d like to acknowledge one detail left out of Jill’s article. It was brought to my attention by a descendant of Damiano and Oliva that there was no mention of their daughters or the role they played in establishing the family businesses. This was an unfortunate oversight and I offer my apologies. Yes, it is my understanding that all of the children (including their daughters) worked hard to help the family prosper in a new land. Until they married and left the family home, the five Genetti daughters all contributed in some way to the growing business. Two daughters, Esther and Anne, also had official job titles within the Genetti company. According to the Federal Census, Esther never married and worked for many years as a bookkeeper in the family business. Youngest daughter, Anne, was also a bookkeeper in the Genetti offices until her marriage to James McNelis in 1932. 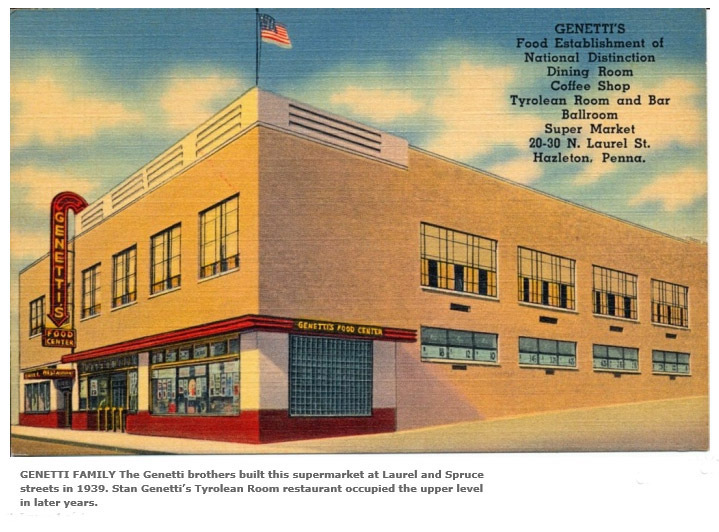 Our family history centers around the four Genetti sons, but often ignores their sisters and the part they played in establishing D. Genetti & Sons. My sincerest apologies to the descendants of these dedicated women (Dora, Tillie, Esther, Erminia and Angela) who were regrettably overlooked in this recent article. I also would like to acknowledge the many grandchildren (and great-grandchildren!) of Daminano and Oliva who worked in the family businesses throughout the years. You are part of the entrepreneurial spirit our ancestors brought with them on the long journey from Castelfondo to Hazleton. I applaud your contribution to our family history! It’s an exciting time for the Family, and mostly because of Louise. It has been such a memory trip going back so many years. It just reinforces how important families are, and how they help foster what we become as adults. Grateful to learn more about our family history. This is a priceless GIFT that all of you have offered to us. Thanks Kathy! I will be posting more info about DNA in future blog posts.